In May 2016, staff from the CSF Brazil team travelled to the Salgado Paraense region, located on the northern coast of the state of Pará. Their goal was to collect important information as part of our project on the sustainability of mangrove ecosystems. This project seeks to sensitize the government and society to the benefits these ecosystems provide, and make recommendations about economic instruments that could be used to promote financial sustainability of protected areas. Considered the largest continuous mangrove in the world, much of the Salgado Paraense is protected for sustainable use through the Federal Extractive Reserves (Portuguese acronym, RESEX). These reserves allow traditional people to live inside the perimeter while sustainably using the natural resources therein. These important mangrove ecosystems provide a variety of benefits not only for local and regional populations, but also for society and the environment more broadly. 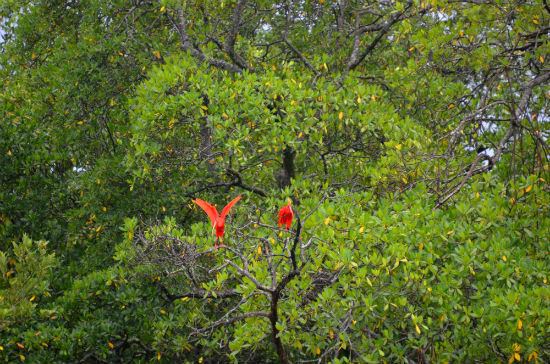 Mangroves maintain coastlines, moderate extreme climate-related events such as strong winds, and also provide a key source of carbon sequestration. In the state capital, Belém, and in Soure and Caeté-Taperaçu's RESEX, we met with experts in fisheries, mangrove ecology, and sustainable resource use. We also met with various stakeholders such as the State Secretariat of Agricultural Development and Fisheries, staff from the Department of the Environment of Bragança and Pará State Department of Tourism, as well as local leaders. This study was supported by the United Nations Development Programme (UNDP) with the Global Environment Facility (GEF) grant financing in the scope of the GEF Mangue Project (Mangrove from Brazil Project), and was conducted in partnership with the Chico Mendes Institute of Biodiversity Conservation (ICMBio)/ Brazilian Ministry of Environment / Brazilian Federal Government and the Brazilian Fund for Biodiversity (FUNBIO).